Looking for things to do in Birmingham this February? Searching for silly holidays to help get ideas for social media posts and blogs? This month’s lineup includes a little magic, a little loving kindness, and a little Nutella … because everything’s better with a little Nutella. Here in Birmingham, we have a fantastic resource in the Civil Rights Institute for learning from the past and hopefully creating a better future. I don’t know about you, but anything that involves Hogwarts is worth putting on my calendar. Break out the wings and dips, because it’s Super Bowl Sunday! I don’t care much about the game this year, but I’ll take an excuse to enjoy good food (and wine) and check out the new commercials any day. I got an amazing new umbrella for Christmas (it opens outside-in, so you don’t get dripped on). On Umbrella Day, maybe I’ll break it out, rain-or-shine. If you’re a runner … more power to you, because that’s just not my thing. But it can be pretty empowering to watch all the marathoners accomplish such an amazing feat and to cheer them on from the sidelines. Could you be raising a future Infomedian? If your kid’s expressed an interested in computers or coding, bring them by the library and sharpen their skills. Or “skillz,” as the case may be. We’re big fans of Random Acts of Kindness Day here at Infomedia — check out our Random Acts of Kindness generator for lots of ideas for fun things to do for your friends, family and coworkers! I absolutely love a good book, and Southern Voices brings together several great authors. It’s a wonderful event for book lovers, storytellers or anyone who wants an entertaining weekend. Want to keep up with what’s going on? 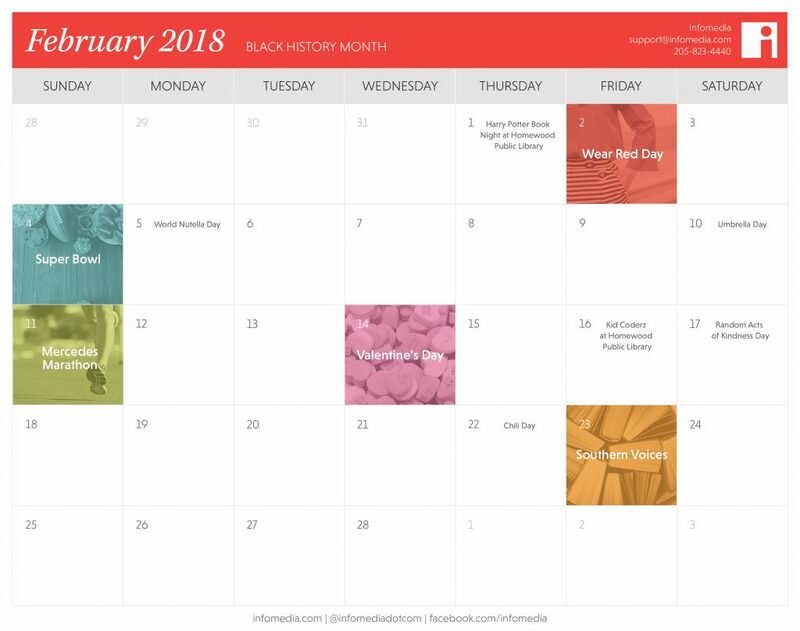 Download our February 2018 free calendar and add a few activities of your own! Leslie keeps our production department running smoothly with the help of lots of cute office supplies, personalized calendars and a morning cup of coffee (with a healthy dose of caramel if-you-please). With over a decade of experience managing production at Southern Progress and Willow House, she’s a natural fit as project manager at Infomedia, and she’s the glue that keeps our team together even during tough projects and tight timelines. Special talents include the ability to sing basically any ‘80s song on-command and find sale items for 20% cheaper with just a little online research. After hours, you’ll find her hanging out with her husband, Chance, son, Wells, and dog, Beau, playing Bunko with her friends, or watching historical dramas on Netflix.